I have not written much lately. And that bothers me, but not much as writing when I’m not inspired bothers me. And lately, there’s been so much that should inspire me, it’s kind of ridiculous that I’ve let my site sit dormant for so long. The trial of George Zimmerman left me each day with a feeling of needing to write, but too despondent to summon the motivation. dressed as a raw chicken. But, hey, hey, hey--I digress. 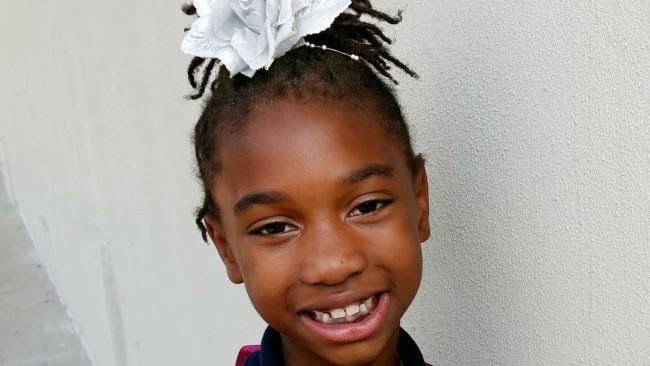 And then there was the story of little Tiana Parker, the girl who was sent home from school for wearing her hair in locs (or “dreadlocks”, as they are commonly known), because natural hair styles such as afros and locs were against the school's dress code. Tiana Parker, wearing the verboten style. As someone who has spent a great deal of time working both with children and with hair, I was disturbed that a place of learning would outlaw locks and afros, two legitimate natural hairstyles that require essentially no unhealthy chemicals or damaging irons, effectively encouraging parents to keep relaxers in their girls’ hair. How is a person’s natural hair not allowed at school? Photo via Art of Manliness. frequently than I'd like to admit. And, even though I resisted the urge to lop the bump off my Semitic proboscis, I have friends and family who were lined up at the nearest plastic surgeon by the age of 16. It was hard enough telling myself I was pretty in a school full of blond hair and button noses; I can only imagine how I would have felt had my school instituted a policy in which my face, in its natural state, was deemed a violation of dress code policy. Sounds like a stretch, comparing a relaxer to a nose job? You're laughing at the idea of mandatory rhinoplasties? Okay, maybe, but given what we know about sodium hydroxide (the active ingredient in most relaxers), I think it's only fair to note that both procedures are just two of the many ways which American women and girls assume substantial risks and discomfort to mold their bodies to a different "standard" of beauty. 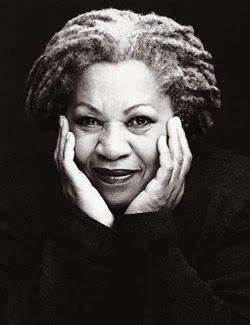 With all this talk of identity and appearance in young girls, I was reminded of a lecture one of my most beloved teachers, Dr. Abdul JanMohamed, gave in regard to Toni Morrison’s novel, The Bluest Eye. 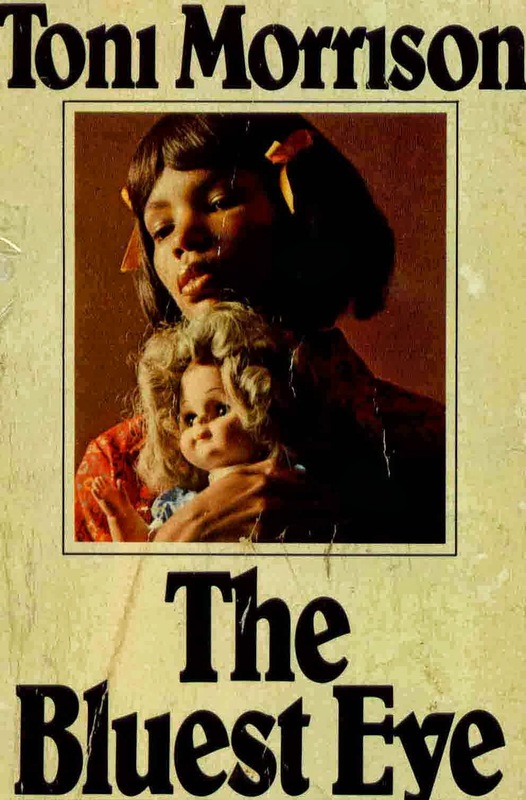 He related the protagonist--a young black girl named Pecola who wants to have blue eyes--to his own daughter, a dark-haired, dark-skinned girl of East Indian descent, who came home from school one afternoon, with a self-portrait she had drawn in art class. The picture was of a girl with blond hair and blue eyes. When he asked her why she drew the picture in a way that did not accurately represent her looks, she replied that her drawing was a representation of what she wants to look like. Blue eyes and blond hair, she told her father, are beautiful. JanMohamed was stunned. How could it be that his daughter, whom he was raising in arguably one of the most liberal, ethnically diverse places in the world (Berkeley), might harbor feelings of inadequacy and ugliness because her looks did not conform to a “Western standard of beauty”? Had he, a man whose job it was to lecture on identity and ethnic stereotypes, failed as a father? Or were societal messages about what is and is not pretty just too powerful for even its most "enlightened" members to combat? This then brought him to tell another story, one about the negotiations made by Toni Morrison when, well over a decade after its publication, she agreed to sell The Bluest Eye movie rights to Oprah Winfrey. As this story goes, the two women were meeting with their respective agents to close the deal. As Morrison looked at the person about to own the film production rights to her book, she noticed something different about her. Her eyes. Oprah was wearing blue contact lenses. Morrison gave pause for a moment, JanMohamed claims, likely wrestling with her suspicion that the novel’s message had perhaps been lost on the Queen of Talk. In the end, though, it seems the dollar won, and Morrison signed the deal with Oprah. “The Ohio schools chief is taking particular issue with the scene in which the novel's main character is raped by her father, commenting that the passage is not suitable for school-age children. On Wednesday, the American Civil Liberties Union sent a letter to [school leader Debe] Tehar challenging her seemingly personal opinion that Morrison's novel is "pornographic." Instead of banning the book, the advocacy organization suggested that Ohio schools "use controversial literature as an opportunity to improve students' critical thinking skills and to create open dialogue between students and the community." “In a 5-2 vote this week, the Randolph County School Board of Education banned the book from county school libraries after the mother of an 11-grader complained. The mother claimed Ellison's work was inappropriate for 11th grade summer reading, citing both language and subject matter. I should add that all of this comes just in time for Banned Books Week (September 22-28, 2013). If you haven't heard about any of this, it's probably because our national fauxtrage has been reserved for a small group of inbred Miss America fans on Twitter, fans who, since the coronation of Nina Davuluri ten days ago, appear to be convinced that the Taliban is taking over the U.S., one beauty pageant at a time (see image to the left). Miss America 2014, Nina Davuluri. Photo via Getty Images. ﻿﻿Not that I don’t support our new Miss America, a woman who, much like JanMohamed’s daughter, is a dark-haired, dark-skinned beauty of Indian descent. I just wonder why sometimes we choose to pick the battles we choose, and why our media chooses to report the musings of morons as if they actually matter. Then again, we live in a country where more girls dream of winning the Miss America crown than the Nobel Prize for Literature (Morrison won hers in 1993). Our girls should be looking towards champions of identity like Morrison or, for that matter, like Tiana Parker, the similarly loc-haired little girl in Tulsa who changed schools rather than would agree to change herself. These ladies, and the controversies that recently surrounded each of them, are worth our tweets, not to mention a spotlight in our weekly news cycle. Finally, I would be remiss if I did not pause for a moment to wax nostalgic upon my own memories of the Miss America Pageant, which I watched with my mother almost every year as a child. 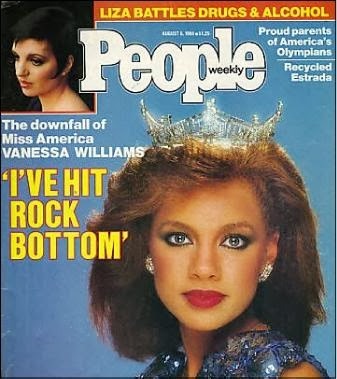 I can remember my mother’s outrage when the legendary Burt Parks was fired from his position as emcee, just as I can remember the joy she expressed when Vanessa Williams became the first African American woman to win the crown. As emotional as that moment was, in retrospect, I am confounded by the irony that exists in “progress” (racial or otherwise) made within an archaic tradition of ranking women based mainly on their physical appearance. Would they comment on anything besides that beauty? Would they mention her merits beyond her appearance, her singing talent, for example? Furthermore, would they foresee that this woman, soon to be de-throned by haters in a shitstorm of scandal (see photo to left), would fight back with a vengeance, eventually becoming one of the most successful performers of our generation? Or would they be too distracted by the intoxicating blueness of her eyes?